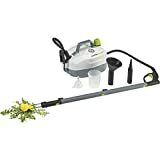 Want to easily kill all the annoying and hideous weeds taking over your lawn without spraying them with toxic chemicals? Then check out this cool new DynaSteam - Weed Killing Steamer. 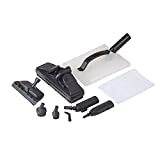 Just point the long wand at a dandelion, crabgrass, or other common weed, pull the trigger for a few seconds, and ordinary tap water is transformed into a blast of super-heated 311º F steam that wilts and kills weeds within 24-48 hours. 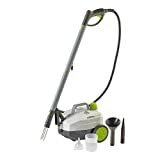 The 48 oz tank provides up to 35 minutes of continuous use, quickly heats up in 10 minutes, has a pressure gauge that indicates when steam is ready, and includes a speed weeding cone attachment, a three-pronged root spike, and a precision jet tip. A safe and natural alternative to using the typical noxious weed killing chemicals around your home.